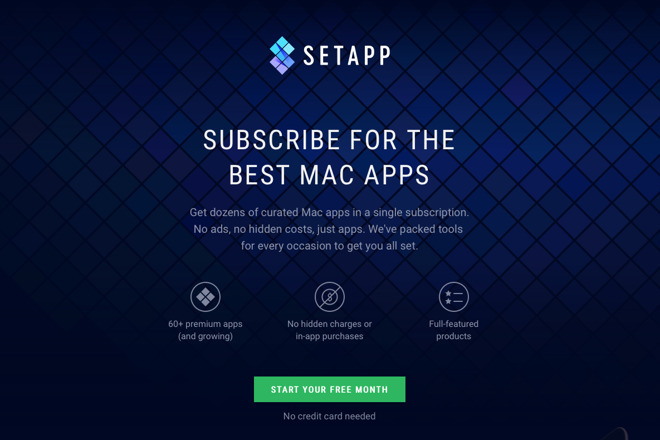 For one monthly fee Mac users can have full use of 61 apps using the subscription-based SetApp. AppleInsider investigates whether "software as a service" is a good model, and delves into the financials of it for mainstream users. Setapp is a new $9.99 a month service aimed specifically at Mac users, and it is a way to use very many apps for one price. So, you could look at it like you would any software and examine what it does, whether it's worth getting. However, Setapp is more significant than a "regular" app because it's really trying to change how we get software. It's doing so with a lot of goodwill from developers who are making good, great, and often superb software but are struggling to survive. Where software used to cost hundreds of dollars, it's now always a pittance and often free thanks to the mobile device mentality. If this continues the way it's been going, independent software developers will go out of business. If they're to survive and we're not to end up with apps as poor as most on Windows and Android, something has to give. Setapp is offering a potential solution. For a monthly fee of $9.99, you get full use of all the apps in its collection. At launch that's a total of 61 apps but you can expect that to grow. Even as it stands, 61 apps for ten bucks a month is a good deal. Right now, if you were to buy all of the apps individually from the Mac App Store or from the developers, it would cost you approximately $1,770.75. That's a very approximate cost because some of the 61 apps are sold in Euros or the rapidly falling British pound and we've had to convert them. Then, at any one time, at least one of the apps will be on sale but as fair figure, you'd have to lay out getting on for $1,800 bucks to buy all of these apps. You won't do that because there's just no chance that you want all 61. You will want some: you will find some that are good for you. There are no games in the set but otherwise it's a nicely broad range with apps for productivity, for image work, for writing and for developing your own software. The most expensive app in the set at launch is a database one, SQLPro Studio which sells for $109.99. The second most costly is website tool RapidWeaver which retails at $99.99. At the other end there are currently 15 apps that would normally sell for $9.99 apiece but there is also Numi, a math app that is actually free and in beta. Remote Mouse, which lets you use your phone as a kind of trackpad, plus blog writing tool Blogo are free too, but with in-app purchases. Many, many of the apps have purchasable extras and they are usually free to you as a Setapp user. It's more complicated and somewhat confusing with Remote Mouse as Setapp gets you the Mac app but you clearly need another one for your phone and that has its own In-App Purchases which you don't get for free. Price is not a measure of quality —even if it were, quality is no measure of whether something is of use to you. If you're not going to design a website then RapidWeaver can be as good as it likes, it's still of no use to you. Some of these apps have been heavily featured in bundles. You may already own some, and that affects the usability math as well. That said, there are apps in this Setapp collection which are true highlights that are likely to be of wide use. 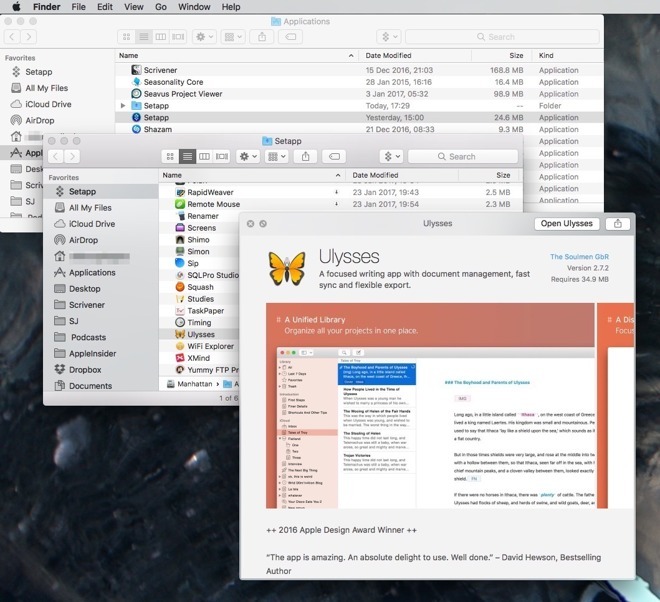 There's the Ulysses writing app, for instance, and the To Do app Taskpaper. If you already own an app, you get it again with Setapp, by the way, so you can end up with two copies of Ulysses running on your Mac. We've not had any problems, any conflicts, we've just been a bit confused over which one we've opened and which one will vanish if we stop paying the monthly fee. That's how Setapp works: as long as you keep paying, you get all of the apps. It's being described as the Netflix of software —but really it's more like Adobe's Creative Cloud. One fee gets you the apps you want to use all of the time plus extras you can dip into. If you only ever want to record your Mac's screen once, for instance, then fire up Screens and do it without having to pay out for an app you won't want again. Setapp is trying to do something new, and sometimes that doesn't fit very easily with the macOS Sierra that we're familiar with. For instance, to get started you download the Setapp app and drag it into your Applications folder. Double-click on it and you expect to start working but actually, no, what you're doing is installing Setapp. Do that and it works away for a minute, then nothing seems to happen. You have to double-click the Setapp icon again to now launch the service. Once you've done that and it takes another couple of minutes to get properly going, you end up with what looks like a folder within Applications. You also get a menubar icon and every Finder window where you show the Favorites column now has Setapp up at the top above All My Files and iCloud Drive. During the setup, you can also choose to have Setapp put a folder in your Dock. 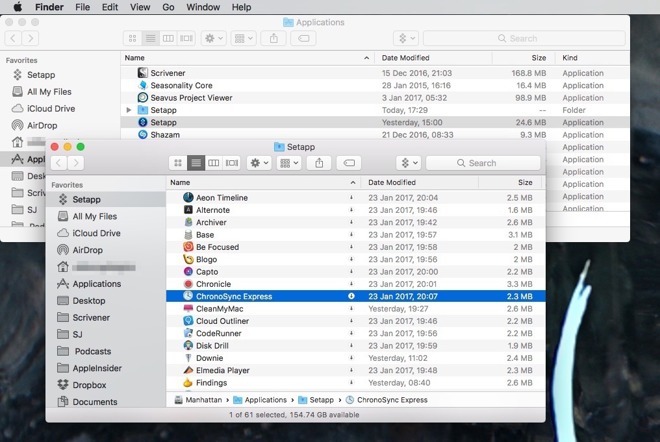 If there's a way to find an application on your Mac, Setapp has it covered. Whatever way you then open Setapp, you're opening a folder which contains icons for all 61 apps. Basically, what you've got is like 61 mini installers that the Setapp company calls teaser apps. Before you actually install anything, the 61 take up a total of only 148.3 MB of disk space. You can hide any or all of them, but that doesn't delete these teasers from your disk, it only removes them from your sight. Maybe you already know what Aeon Timeline does but not know what Manuscripts or Chronicle does. Click once on any app and then press the Space Bar. In almost every case, a Mac App Store-like window opens up showing a screenshot and describing what the app does. It's supposed to happen in every case but we found sometimes Quick Look just told you the app was a folder. You can install anything to see what it is and what you make of it, though, by just double-clicking on the app icon. The first time you do this, launching takes several minutes: it's really downloading, installing and then running the app. The second and subsequent times you open the app, though, it is as fast as usual. The app is on your Mac and it will stay there until you remove it or you stop paying your monthly fee. You can also choose to uninstall apps you no longer want. There's an overall Uninstall option in the menubar app which will remove the whole of Setapp in one go but otherwise it's app by app. Usually that means dragging the app to the Trash and that's the way we found for every one we tried, plus it's the only example the company gives. However, the Setapp firm says only that you uninstall them as you would regular apps: the implication is that some may need you to run uninstallers. If that's the case, though, the app's initial download comes with it. Having $1,770.75 worth of apps for $9.99 is clearly a bargain for the first month. Like any other rental system, though, there's a question of when it's better to buy and when you can actually afford to. In the long term it might cost more to rent but if you can't afford to buy the apps you need outright then carrying on renting makes sense. When you can buy, though, there does quickly come a time when you are better off buying than renting. If you only ever used that SQLPro Studio then it takes 11 months before you're better off having paid its $109.99 purchase price. If you only ever use Ulysses, it's 5 months. Or if one of the $9.99 apps is the only thing you use, you should've bought it directly instead of subscribing to Setapp. In practice, though, you're going to end up using a handful of the 61 and that means there's no easy way to determine the point when you should buy instead. However, that's part of Setapp's benefit. As well as this cheap access to software, it is access to software that you're not yet sure about. It's cheaper to sign up to Setapp and check out an app in great detail than it is to buy something you might find isn't quite what you need. If you're the developer of one of the apps in Setapp then you get a monthly income based on how many subscribers use your app. That's the obvious appeal but there is also the fact that your app is going to get noticed more, it will be found and used by more people. Once someone subscribes to Setapp, your app is on a reasonably level playing field: it's as visible as everyone else's. There's no Microsoft coming along and getting all the attention. There is not now and there surely never will be a Microsoft, Adobe or Apple joining Setapp because they don't need to. Equally, the Setapp makers say they curate the apps that get into the set, so it shouldn't deteriorate into a dumping ground for anyone with an app they can't sell anywhere else. Where this is going to be interesting as time marches on is in the middle-ground of software. Setapp already has Ulysses but the similar Scrivener hasn't joined yet. Perhaps this is an area where the Omni Group will bring its productivity software, or a model it will adopt. There's no way to know and not really a reasonable way to guess. However, Setapp has a very good price and it delivers its apps well so, yes, this could be the start of something good. Setapp costs $9.99 a month and your first month is free. 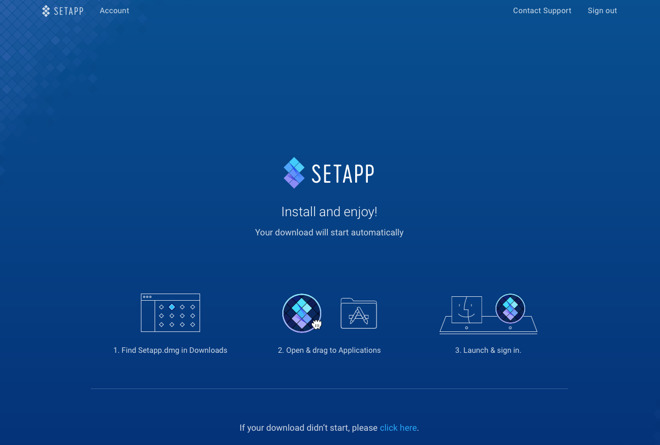 Download the Setapp software direct from the developer where you can also see a complete and up-to-date list of the apps available.